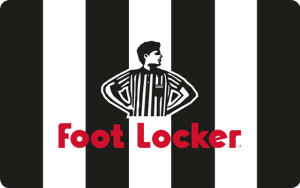 Foot Locker has been a high street store go-to for everyone looking for new athletic footwear and clothing. Quality kicks are their speciality, and as jazzy sneakers make a great present, thankfully you can treat another with a Foot Locker gift card and let them choose from a quality catalogue of the coolest trainers from the best sporting brands. Print off your gift PDF and hand to the cashier at point of payment.